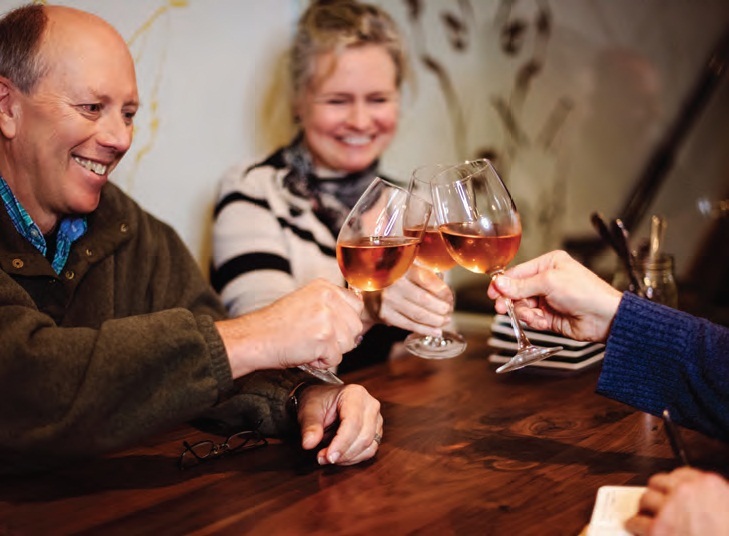 To talk to Polly Pittman and Tom Croghan, the co-owners of The Vineyards at Dodon, about winemaking and the property on which it’s done, is to quickly realize the love and attention to detail the married couple put into every aspect of their winery. From Polly’s extensive details about the history of her family’s eighth generation, 555- acre farm in Davidsonville, to Tom’s deep dives into the science of their soil composition, to say they are “living it” is an understatement. 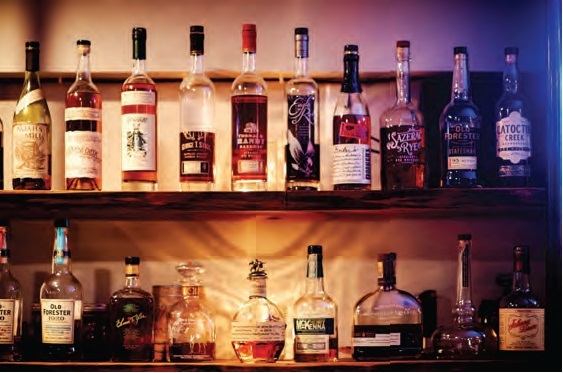 What started in 2008 as a fun way to supplement, as Polly jokes, “wine for our increasingly large family during the holidays,” has now turned into 16 acres of international varieties that are served at restaurants like Baltimore’s James Beard award-winning Woodberry Kitchen and Annapolis’ Fox’s Den. I’ve met the two at the latter, a subterranean spot on Main Street owned by brothers Andrew and Chris Fox and Thomas Burns, that specializes in wood-fired pizzas, small plates, a menu of 40-plus bourbons and local craft beers. It’s the kind of place you instantly want to tuck into and stay a while, with the pizza oven giving it a fireplace-esque warmth and the vibrant crowd making you feel like you’re in on a special secret. Of course, Fox’s Den also has an extensive wine selection, which includes some of Dodon’s offerings. 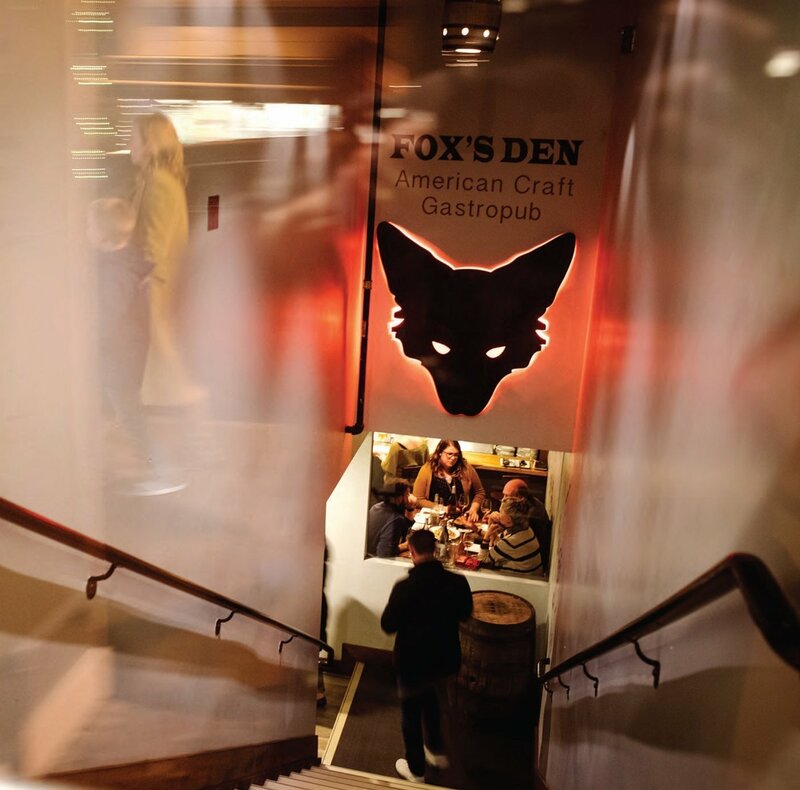 A steep staircase leads guests into the Fox’s Den located on Main Street in Annapolis. “Because we only have 16 acres of vines, we really wanted to focus on only supplying our wine to a limited number of places that we know will totally invest in us and vice-versa,” explains Polly. As we dig into a heaping bowl of mussels and frites, Polly explains how her family started the farm back in 1725. Since then, it’s been home to family who rode with George Washington during the siege of Yorktown, used for tobacco farming and will forever be linked to thoroughbred racing. The horse Dungannon, owned by Polly’s ancestor George Humes Steuart, won the first recorded horse race in Maryland history in 1743 (The trophy is on display at the Baltimore Museum of Art.). In 2006 Tom and Polly built a house on the property where Polly’s brother, Anne Arundel County Executive Steuart Pittman and their mother also have homes, and started raising chickens and sheep. They planted an orchard and eventually put their first grape vines in the ground in 2008. 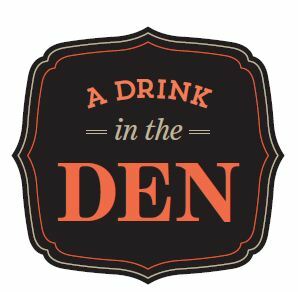 Fox’s Den in Annapolis features wine made at nearby Dodon Vineyards. It didn’t take Tom long to realize they may be onto something. As one of their consultants said after analyzing the farm’s soil content, “If you’re clever, this region could be on par with other great wine regions in the world.” That, Tom says, is because of the soil’s unique composition of Appalachian mountain rock and minerals, along with sediment from when the region was under water more than 12 million years ago. In 2003, the soil was even given its own designation from the U.S. National Cooperative Soil Survey: Dodon Series soil. So in 2010 the couple planted two acres of commercial vines and continued expanding until they’d packed 16 acres with more than 28,000 vines—focusing on French grapes such as cabernet franc, chardonnay, petit verdot and sauvignon blanc. Throughout that time, says Tom, the winemaker, they have used only grapes from their estate, grown with the most environmentally and socially conscious farming methods possible. Meaning, using as few chemicals as possible. 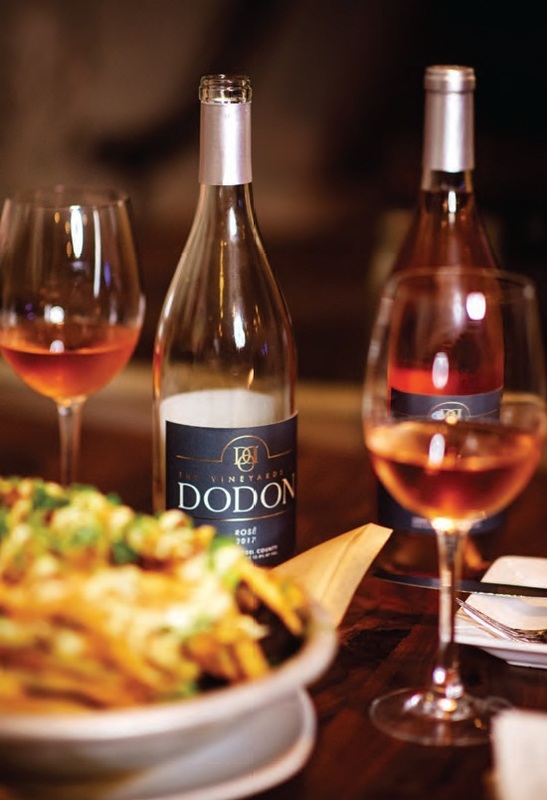 As a citrusy Asian salad arrives at our table, we pop a bottle of Dodon rosé. Its bright, almost effervescent finish is the perfect accompaniment to the salad—which is itself a lesson in texture with its crisp slaw and spiced cashews—created by Fox’s Den’s head chef Brian Hohl. 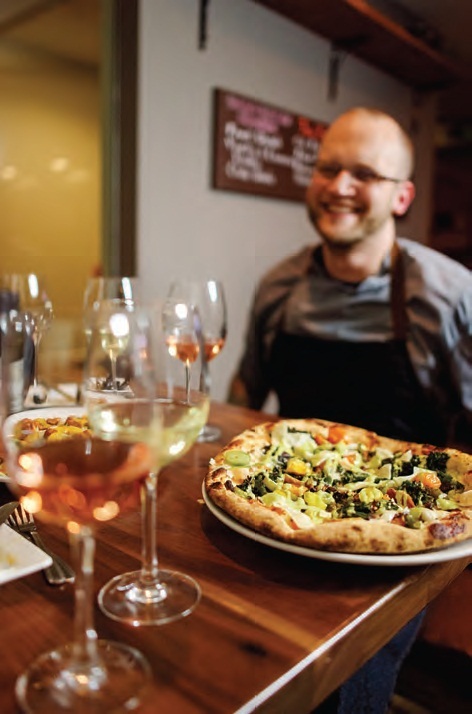 Head chef Brian Hohl serves a Fox’s Den signature pizza. When Polly and Tom discover that a bottle of their 2015 sauvignon blanc—which they haven’t seen in their winery for years—is still available at the restaurant, they both gush with excitement, eager to see how it’s held up. It’s moments like this where you can see just how much the couple loves what they do. The wine is still full of notes of apple and melon, but Polly isn’t afraid to admit that she thinks their 2017 is a bit more balanced. Tom’s approach to winemaking is characteristically scientific, based on enquiry and experimentation. “The hallmark of science is about figuring out what questions to ask,” he points out. 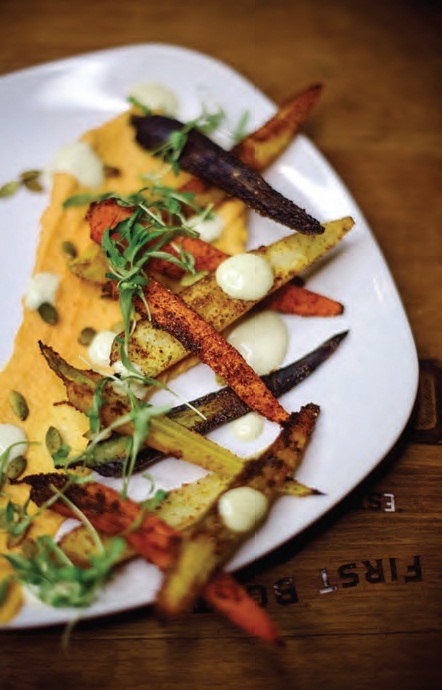 That may be true, but when it comes to flavor, The Vineyards at Dodon and Fox’s Den have come up with some pretty good answers.